Select the company you wish to update. Click on Setup & Configuration, and from the drop-down menu select Videos. Click on either the Page Videos or Benefit Videos tab. Once you are in the correct tab, click Add New. In this example we will be adding a video to a page. TIP: The Page Videos tab will add the video to a demographic page, such as the Welcome Page, whereas Benefit Videos will add the video to the Benefit Enrollment Page. Video Selection Method - Select the radio button next to From List if it is not already selected. Select Video - Use the dropdown arrow to select the video to be added to the page. Page – The page in which you would like to assign the video. Title – The name of your video. This is not viewable to employees. b. Regular – Video is to the right of the enrollment page. TIP: When assigning a video to the Welcome Page, the Video Type should be set to Awareness. Language – The language your video is recorded in. The system currently supports English and Spanish. 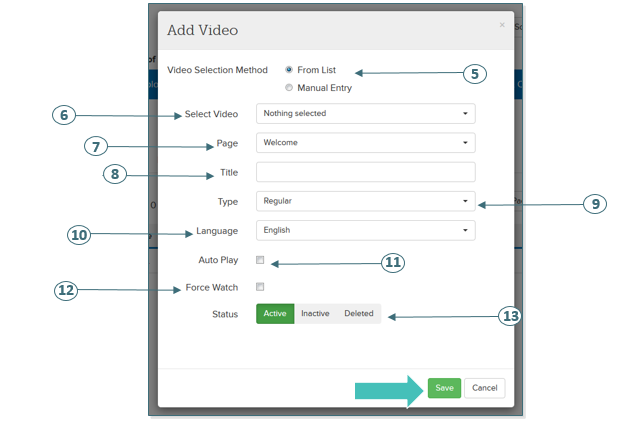 Auto Play – The video will automatically play when the employee lands on the page. Leave the box unchecked to give the employees the option to hit the play button. Force Watch – Employees will be forced to watch the video prior to making elections. Leave the box unchecked to give the employees the option to hit the play button. Status – Set the video to Active or Inactive. TIP: If the video is no longer applicable and you would like to remove the video, for historical purposes; it is recommended to set the video to Inactive rather than deleting the video.